On Sunday afternoon, we celebrated the Mia’s 70th birthday. A native of the Netherlands and one of the Lay Centre staff, the celebration involved a few grandchildren. So, even though it was a couple weeks early, we were blessed by the presence of the traditional Sinterklass and his assistant, Zwarte Piet. Eveline’s family had just been visiting and brought some goodies from home, and she shared some of the pepernoten, a traditional St. Nicholas day treat. One of the things that got me on the good side of our resident Nederlander early on was sharing how my family has celebrated St. Nicholas day as our primary gift-giving day for years, complete with wooden clogs. 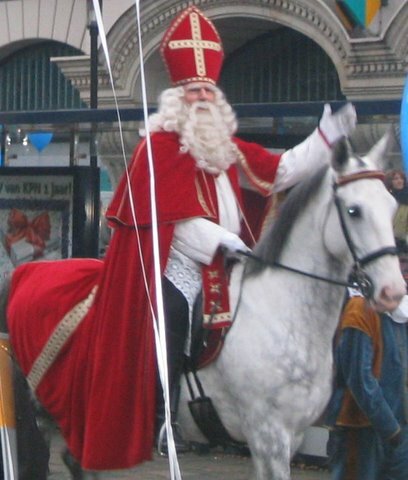 I nearly lost that endearment on Sunday, however, when I mentioned that though St. Nicholas was a bishop in Asia Minor (modern day Turkey), that Santa Claus lives in the North Pole – without any Zwarte Pieten, just elves. Spain? How about the reindeer then? 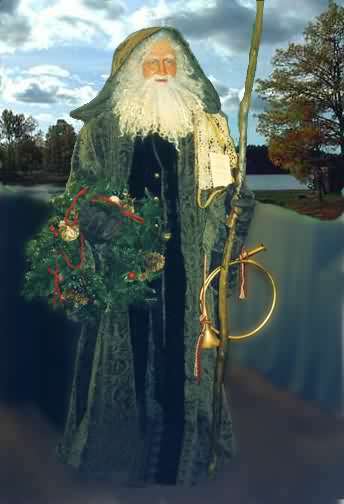 In the Netherlands, the big celebration is on December 5th, St. Nicholas Eve. St. Nick lives in Spain, and makes his journey to the Netherlands by boat every year. For about three weeks before his feast day the news reports the location of the steamer… not unlike the Air Traffic Control tracking of Santa’s sleigh in the U.S. Instead of elves, Sinterklaas is assisted by Zwarte Piet (Black Pete) – actually several Swarte Piets. He’s the one who carries the bag, from which children are either given presents if good, and a lump of coal if bad. 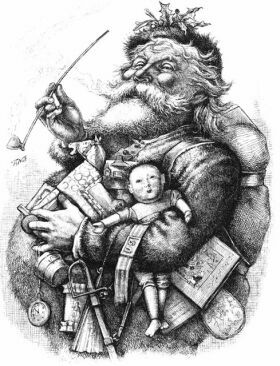 One version is he’s black from the soot of the chimneys he climbs down to deliver the gifts (an unfitting task for St. Nicholas himself, apparently), another is that he is a Moor, a natural companion of a St. Nicholas who lives in southern Spain. 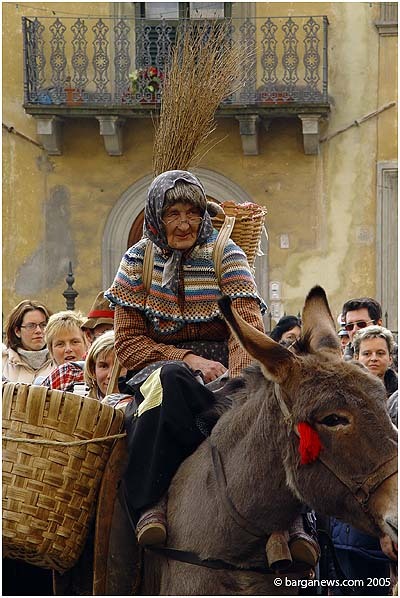 In Italy, it is the old lady/witch Befana, not St. Nicholas, who comes bearing gifts, and she already made a minor appearance on Hallowe’en. Her arrival is usually on Epiphany, January 6. By legend, she had provided housing for the Magi on their journey to find the Christ-child, and refused an invitation to join them, only to decide later that she would seek him out. When she found him, his gift in return was that she would be ‘mother’ to all the children of Italy. Only the Christians in Ghana celebrate Christmas, it has not become a secular or national holiday as in the U.S and much of Europe. Once a British colony, it is Father Christmas who comes with gifts. Kassim, though he played an excellent Swarte Piet for never having heard the tradition before, could not provide much more as his Muslim family did not usually celebrate Christmas. Norway has the Julenissen, or Yule Elf, who comes to the city-folk by a reindeer-drawn sled but for the country-folk usually arrives on cross-country skis. Clearly a combination of St. Nicholas and the Nordic Yule traditions, he does not bother with chimneys, but will just come in the front door. Speaking of elves, that provided an interesting aside. As I was explaining that Santa Claus was aided by elves, I got to thinking that they are really more like dwarves than elves, especially if you think in Tolkien terms. Eveline asked something about their wings. Wings? Elves do not have wings! “So what do you call Tinkerbelle?” Oh, a sprite, or a fairy. Aha! Fairy = Faerie = the Fae = Elves. Interesting that the same origin would conjure such different images, from a Tinkerbelle type fairy to the Elves of Tolkien and Shakespeare’s Midsummer Night’s Dream! Something I probably knew as a child, and had forgotten. Just like the fact that St. Nick lives in Spain, not the North Pole. How could I forget that?